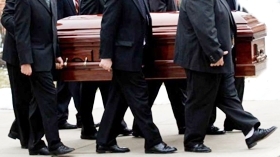 I was a pallbearer at a funeral today. I’ve never had that role in a funeral before and it was interesting. There were four of us (supposed to be six!) and the task consisted of rolling and carrying the coffin from the church to the cemetery. It was a couple of hundred yards, part of it uphill on a gravel road with the last 100 feet or so carrying it. It was easier to carry the coffin than to pull it up that gravel road. The effort, willingly given, was also a source of reflection. My pondering brought up a long-standing personal meditation on the circle of life. This time on the last part of that circuit – death. As a general thing, I usually assume people are afraid to die. The only actual number I could find for “afraid of dying” was in a survey of apparently Christian, church attendees, aged 50+ that found 20% were afraid of death and 73% believed in some form of afterlife. Fear of death was highest among people who believed in hell as one of the afterlife options (Barrick, 2007). Well then, it seems that fear of death is not too prevalent, but all of us know someone who had a hard time letting go of a loved one who was dying. My Dad did not want to see my Mother slip away. It was so very hard on him. Yet, death is inescapable. Allowing for a few exceptions in history (Jesus, Mohammed, Buddha) everyone who has lived on Earth will die here. Why is death not an emotionally integrated process in the American way of life? One person who has helped in this area is Marge Jenkins. “One group of people that I saw are people who were dying, from the ages of nine to 90,” says Jenkins. “They didn’t know anything about how to prepare for life’s ending. I decided that I needed to help these people.” Jenkins offers workshops and a book with advice on how to plan for one’s death (Jenkins, 2008). A final thought. There is advice on helping the dying person to process and cope with impending death and we often talk about comforting the dying. What if the dying took special care to encourage and comfort those they are leaving behind? Barrick, A. Survey: How 50+ Americans View Afterlife. IRC, 2007 (http://www.icrsurvey.com/Study.aspx?f=AARP_080707.htm). Jenkins, M. You Only Die Once. Perfect Publisher, 2008 (http://www.margiejenkins.com & http://www.amazon.com/You-Only-Die-Once-Preparing/dp/0929488776).